Last year, Katherine had the opportunity to play the "She" in She Kills Monsters as part of the Steppenwolf Garage Rep. As an alumna of the School at Steppenwolf, it was incredibly fulfilling for Katherine to return to the landmark arts organization as a performer. The show was produced by Buzz22 Chicago, a talented young company founded by recent Northwestern University grads. Katherine loved working with the innovative artistic team and cast almost as much as she loved honing her sweet broadsword skills. (Spoiler Alert: she killed a five-headed dragon.) She Kills Monsters won the American Alliance for Theatre and Education Distinguished Play Award and was also named one of Time Out Chicago's best plays of 2013. Watch the She Kills Monsters promotional trailer by clicking on the photo of sword-wielding Katherine in the snow. 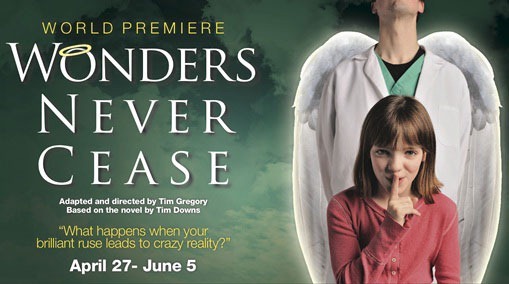 In this humorous and powerful production filled with mystery and manipulation, Katherine played Natalie Pelton, a hard-working nurse and single mother whose daughter starts to see angels. This was Katherine's third time working with Tim Gregory, who directed the play and adapted it for the stage. 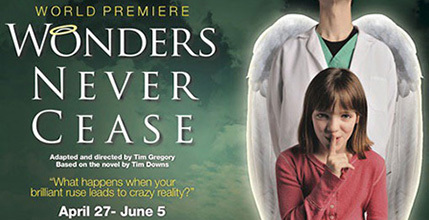 Wonders Never Cease, the play, is based on a novel of the same name by Tim Downs. The talented Wonders cast included three published authors, an Oprah impersonator, and the voice of the Pillsbury Dough Boy. Katherine's favorite? 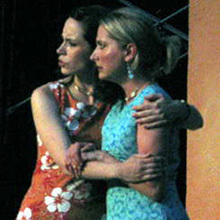 The delightful Caroline Heffernen (pictured, right), who played her daughter Leah. Prior to Wonders opening, Katherine had the exciting opportunity to perform scenes from the play during a radio interview on WMBI Chicago's Morning Drive. She was joined by novelist Tim Downs, director Tim Gregory, and fellow actor Matt Klingler. Below are the two scenes from the interview featuring Katherine and Matt. The full interview can be found on Tim Downs's blog. 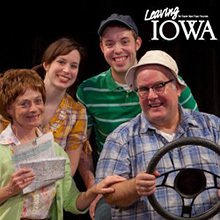 Katherine was thrilled to return to the role of Sis in Leaving Iowa, having understudied the part for a year during its successful run at the Royal George Theatre. While working on this show about a family road trip, life imitated art: Katherine and three of her castmates carpooled together to Fox Valley, a 90-minute trek from the city. As a general rule, everyone was on their best behavior. Nobody asked if they were "there yet" and everyone "pottied up" before they embarked. 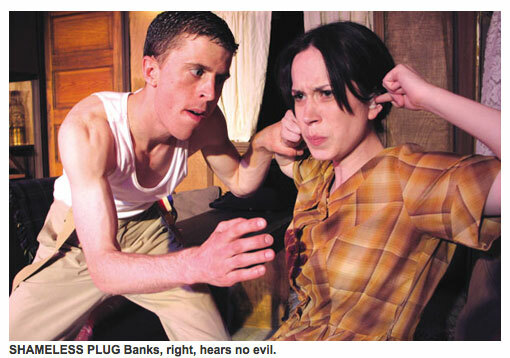 Katherine is grateful to the play's writers, Tim Clue and Spike Manton, for their endearing script. 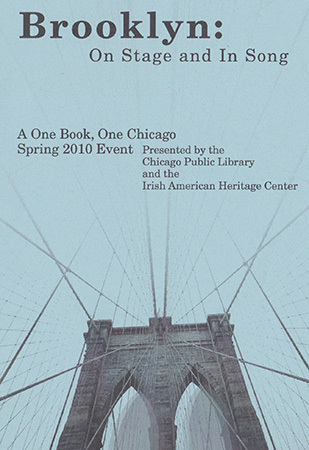 Brooklyn was a staged reading at Chicago's Irish American Heritage Center featuring excerpts from Colm Toibin's novel of the same name. 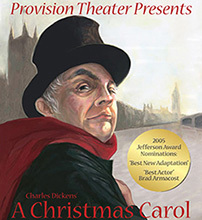 The performance was adapted and directed by Michael Patrick Thornton and Lindsey Barlag and presented as part of the Chicago Public Library's "One Book, One Chicago" program. In this coming-of-age immigrant story, Katherine played Eilis, the protagonist, a young Irish woman in 1960's Brooklyn. 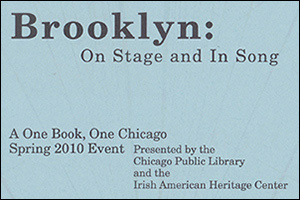 Katherine particularly enjoyed Brooklyn because it allowed her to reunite with her former School at Steppenwolf teacher (Thornton), practice her ceili dancing, and concentrate on something other than planning her wedding, which was just six days after the performance. It was a privilege for Katherine to work for the public library system and to tell such an amazing story with a gifted cast. 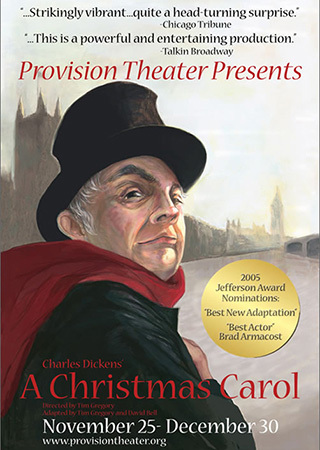 Katherine was fortunate to perform in Provision's A Christmas Carol two years in a row. 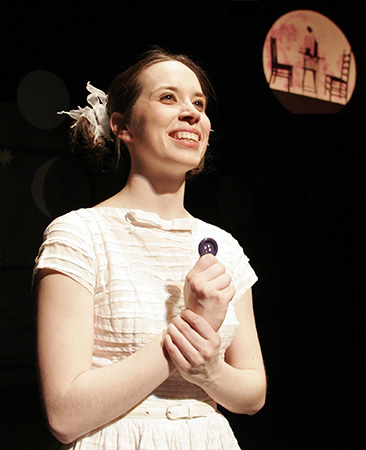 In 2005, the performances took place at Stage 773 (formerly the Theatre Building) and Katherine played Fan and Bess. In 2006, the show moved to Victory Gardens Greenhouse, and Katherine played Martha Cratchit and Fred's wife. In addition to these named characters, each year she played more than five ensemble roles. It was incredibly fun to do a holiday show, but who knew the Christmas spirit came with seven costumes worth of petticoats and hair pieces? Still Life With Iris has a special place in Katherine's heart for many reasons. First, she loved the show's themes of home and memory and had the chance to do some soul searching about what "home" really meant to her. Second, she wore a white flouncy frock. Third, she met great friends. Fourth, she was able to spend time with and learn from the late Travis Dow, who played her father. Fifth, she loves theatre for young audiences and Adventure Stage Chicago (f/k/a Vittum Theater) is particularly good at seeking out school groups who don't normally have access to the performing arts. Many of the children who saw Still Life had never seen a play before. Sixth, this is the first show her godson, Logan, ever saw her in. 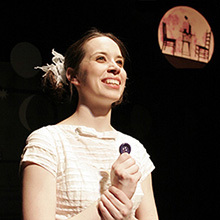 In one of her first shows after graduating from college, Katherine played Luciana alongside a cast of veteran Chicago actors in The Comedy of Errors. This was also her first outdoor production and thank goodness director Jack Hickey set this production in the Caribbean. With the temperature coming close to 100° many days that summer, everyone was thankful to be wearing sundresses and shorts, as opposed to Elizabethan tunics. This production also marked the beginning of Katherine's ongoing relationship with Oak Park Festival Theatre, where she currently serves as the outreach coordinator. 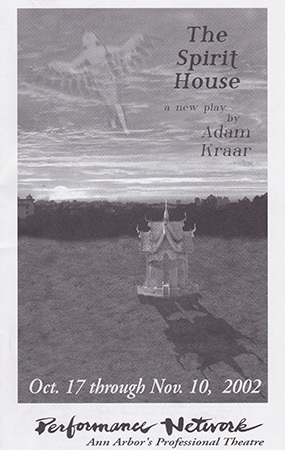 "Written with passion and vigor, this play transforms the simple idea of an American family in Thailand into a thickly layered story of how the spirits of one culture can seep into the skin of unsuspecting visitors." 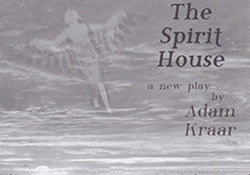 Katherine performed the role of Aurora in the world premiere of The Spirit House during her senior year at the University of Michigan. Katherine is so grateful that she was able to kick-start her professional career while still in school and that she had the chance to meet with playwright Adam Kraar during his brief visit to Ann Arbor. Her performance garnered her an Ann Arbor News Award for Best Actress in a Drama.